When we lived in Westport back in ’04, we became rabid sushi eaters. A typical week saw us picking up or getting sushi delivery at least twice a week. 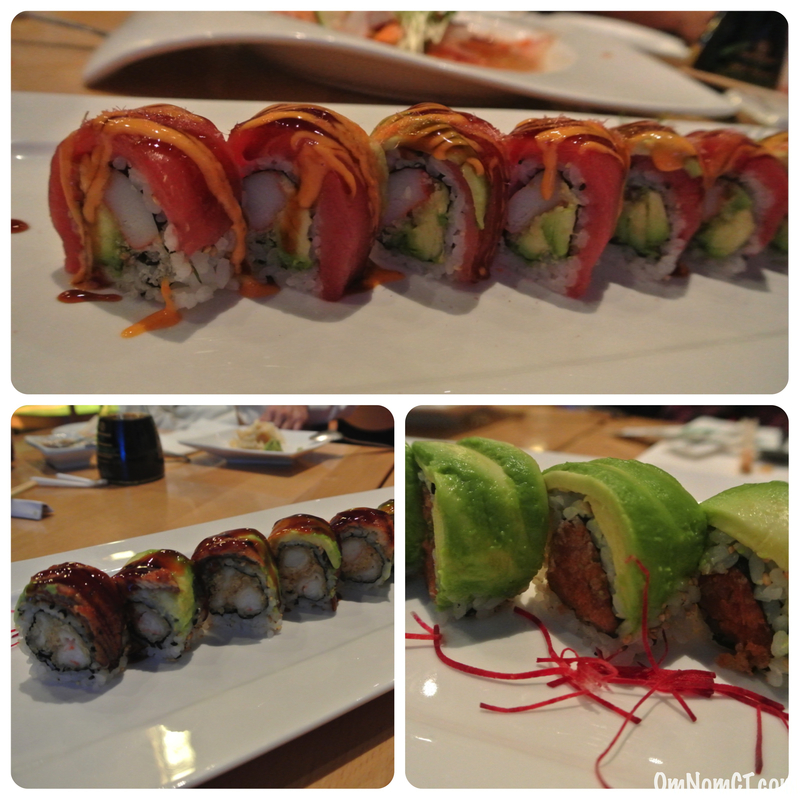 You might say we had a problem, though we’re sure Matsu Sushi didn’t think so since we usually got it from them! They were not only conveniently located right down the street, but their sushi was always fresh and delicious. But, it’s been a loooong while since we’d been, so long in fact that we hadn’t realized that when we were invited to check out Matsu, that this was the restaurant we had always ordered from. Quite a happy coincidence! Parking was very easy across the street at the Library (which we *think* is legal after hours, but we can’t be held accountable if not, lol). That particular night we had the pleasure of dining with one of the owners, Paul Teoh and his partner. They took us through their menu, their history, sushi culture, and seemingly every single dish on their menu. First up, there’s plenty to drink here. Whether you’re looking for cocktails, wines, imported beer, or even sake, they have a good variety of choices. We decided to try some of their cocktails to start, like the exotically delicious Matsu Sunrise mixed up with Malibu, grapefruit, and Grenadine, and the Pineapple Mojito Colada which had the rich creaminess and strong pineapple you expect from a colada, and a nice slight vodka and mint finish. 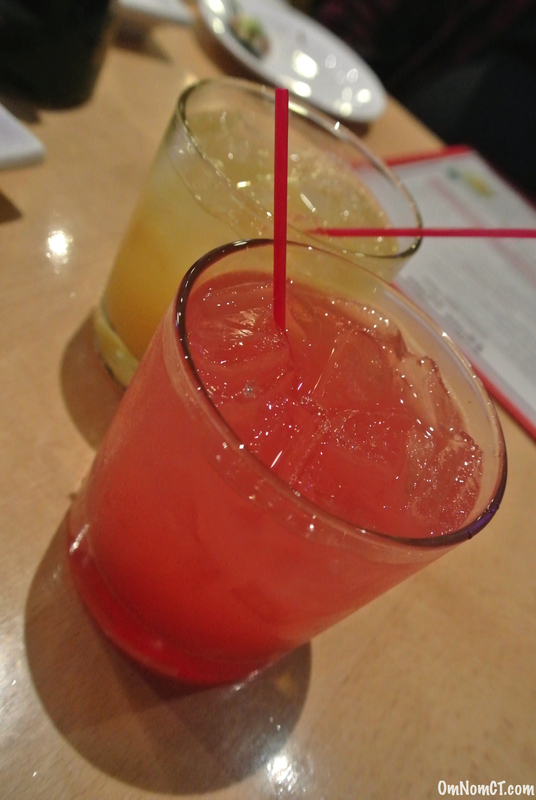 Good, solid drinks all around. As we drank up and talked about Matsu’s history, the fish parade began. 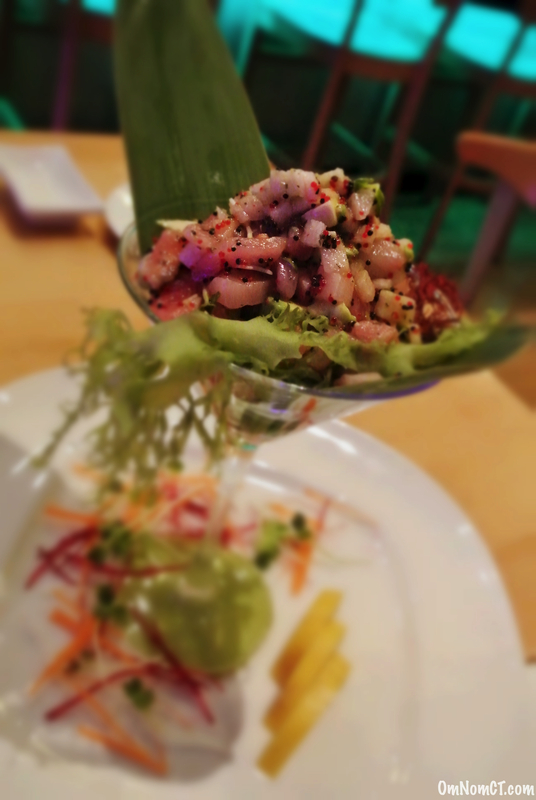 The first dish we tasted was a special, the Yellowtail Martini, which included avocado, Masago, and pear. The pear in this dish added a nice crispness, the Masago added another level of crunch, and the avocado gave a nice fatty creaminess to round it all off. Of course, all of this wouldn’t be great unless the fish was of excellent quality. All of the fish we had that night was fresh, cut beautifully, and served with precision. As we finished up the Yellowtail Martini, we were brought the Tuna Pisa which included scallions, chopped tuna, and Masago, all served in a Yuzu and miso sauce. The tangy and earthy sauce served as a nice complement to the delicate nature of the fish. Again, a perfect balance of textures. Up next was the Confetti Salmon Salad which was interesting for its use of raw and shaved veggies like squash, radish, and beets. 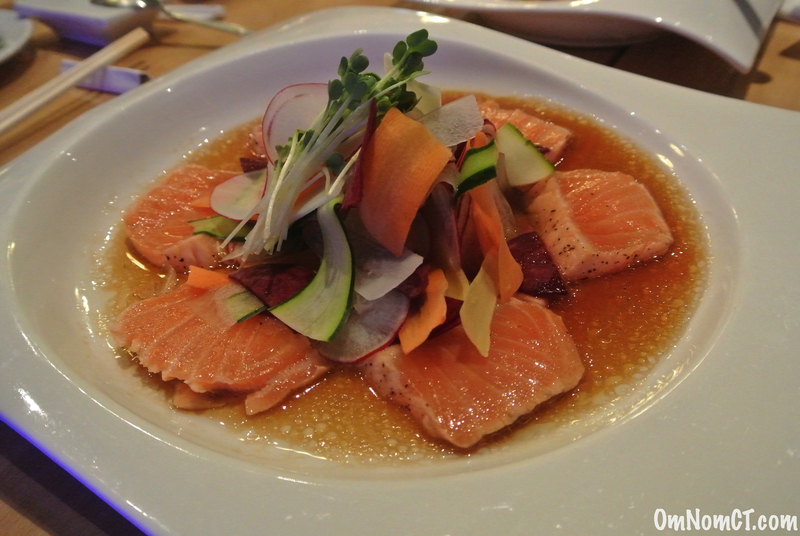 Served along with the veggies was a nicely seared salmon and a bright and citrusy Yuzu dressing. This was nice a light and refreshing. And, then came the rolls! We had the Foxwoods (created by a long-time customer who loved to go and gamble there) with Kani, avocado, and crunch inside, and Toro and more avocado outside. This was a great roll, fresh, and had bursts of flavor, highlighted nicely with a spicy sauce on top. We also tried the Jade Roll that had spicy tuna, salmon, Yellowtail, and seaweed salad on the inside and avocado on the outside. The seaweed added a nice briny/saltiness, with a gentle spice coming from the tuna. And, last up was the Disney Roll with shrimp tempura inside and eel and avocado on the outside. The tempura inside gives a fatty, warm, rich crunch to the roll, contrasting nicely with the eel and the creamy avocado. As we ate roll after roll, Paul talked to us about sushi culture and what it takes to become a sushi chef. It was interesting to learn that you need to work behind the scenes at a sushi restaurant for at least 10 years before you’re even allowed to be at the bar. That’s why in Japan, they bow to the sushi chefs; they’ve earned the respect! When you think about it, that’s almost as long as a doctor’s course of study, so we give some major props to Head Chef Song at Matsu. Now, onto our next course (yeah, we’re only half way through the meal at this point), the Assorted Sushi + Sashimi Platter. It can be a bit overwhelming when you see so many cuts of fish in front of you . . . some of which you can’t identify, and some of which are still alive! 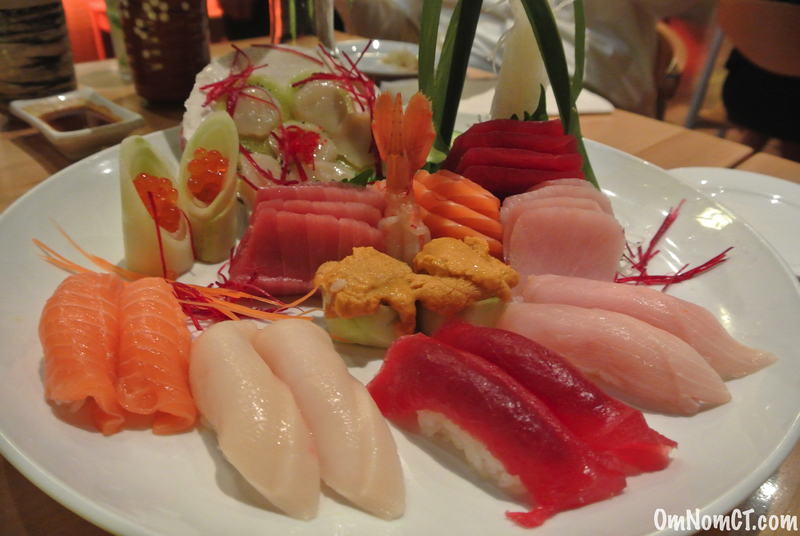 That said, it’s a great way to try many different kinds of fish and to get a crash course on the world of sushi. There was toro, tuna, salmon, uni (sea urchin), giant roe, and live sliced scallops that were still moving on the plate. All the seafood was excellent, fresh, and was cut precisely and cleanly. We actually liked it all much more than we even thought we would. 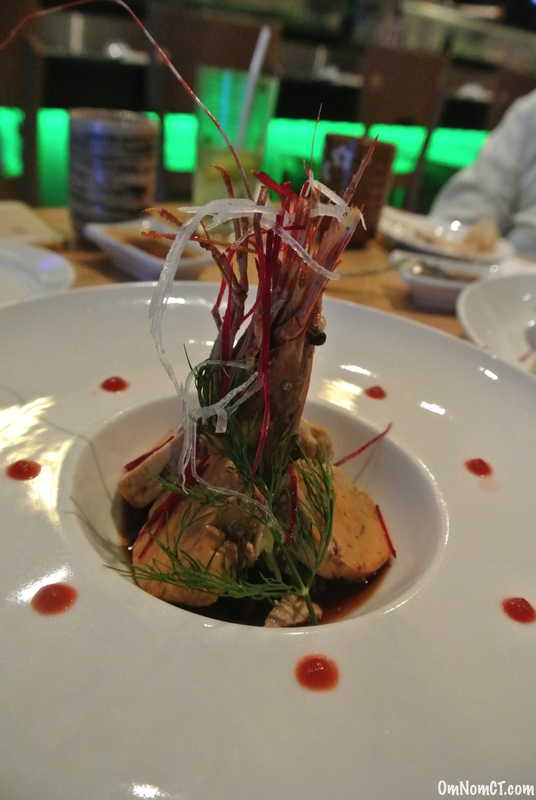 Soon after, we had a special delicacy: Monkfish liver. We were intrigued, actually having to admit that we didn’t even know that Monkfish had edible livers. And, while it didn’t have that bitter, mineralistic flavor that we dislike about liver, it wasn’t something that we would go out and order. 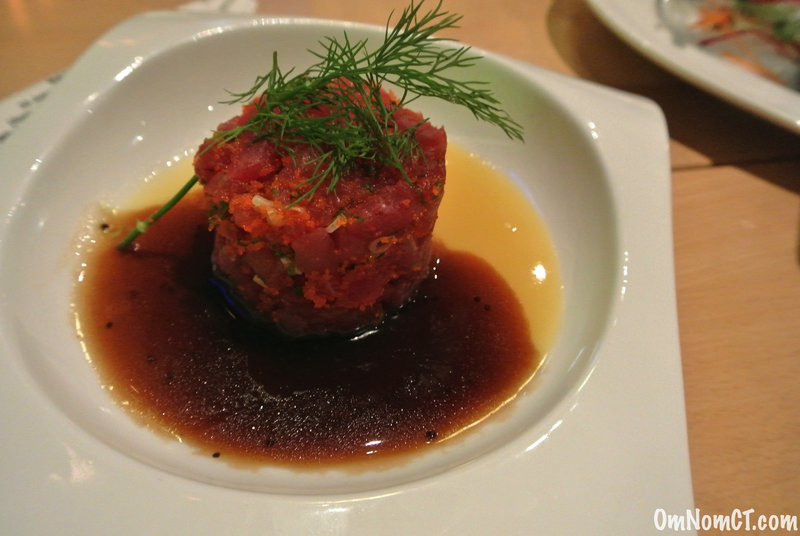 It was interesting, though, because it had a similar taste and texture to chopped tuna. We also were able to try the Rock Shrimp which was crispy and crunchy outside, highlighted well with a cream aioli drizzled on top. And, finally wrapping up the main portion of the meal, we had the chance to try some of the food that they serve from the hibachi that they have in the kitchen. Their noodles were excellent, with a warm garlic flavor throughout the dish. The beef was definitely full of flavor, but a bit tougher than we like. The shrimp, on the other hand, was nicely cooked. We also tried the Negimaki which is Teriyaki-marinated beef rolled up with scallions inside. The scallion added a nice crunch and flavor with a rich Teriyaki sauce on top. There might have been too many scallions, but it is still a nice dish and is one of their most popular apps on the menu. Finally, it was time for dessert. We only had room for some ice cream (actually we really didn’t have room at all but we didn’t want to be rude). We went with their Green Tea Ice Cream (Kristien’s fave). It was creamy and had that wonderful tea flavor that calms down a belly after a crazy meal like he one we had just finished. But, not to be outdone, Paul had given us some Mochi (ice cream with sticky rice on the outside) in red bean, strawberry, green tea, and mango flavors. This was our first Mochi experience, but it definitely won’t be our last. 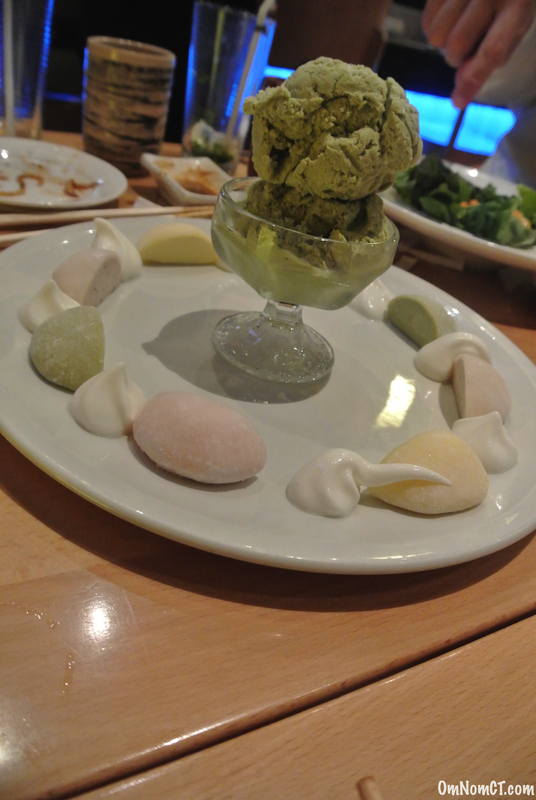 It was delish with our favorite flavors being green tea, mango, and red bean! Overall, we feel like Matsu remains an important part of the Westport dining scene with fresh, well executed, reliable dishes. Whether you’re with friends, family, business colleagues, on a date, or with kids, Matsu is sure to have something to please everyone and the ambiance is just chill enough for any situation. Although we were invited to try the food at Matsu, our opinions, feelings, words and tasting notes are our own. Just saw that there’s a Groupon for Matsu, even more of a reason to finally give it a try! Thanks for the review! We ate their last week and found the food to be decent but from the minute we sat down, the servers were rushing us. From the time we sat down to the time we left was probably less than 40 minutes. They never asked for second drink orders or even asked if we wanted dessert. The location wasn’t even half full so it wasn’t as if they needed to turn the table over quickly. I would not be inclined to return. Carolyn, that’s too bad! We got great service when we went, but they did know we were writing a review. To be honest, we don’t like feeling rushed and get why you wouldn’t go back. We recently ate at a place in PA that was trying to rush us, but we kinda just stayed for hours and talked and drank. Hope your next meal goes better! Oh Leslie, you’re too funny! :) It’s definitely a good, reliable spot to check out. Good amount of apps and great variety of sushi, sashimi, and rolls.